It might not be soup weather anymore where you live, but I woke up this morning to five inches of new snow all over and was in need of a comforting soup to help me warm up. Even though cold snowy days do make soup taste better, I DO believe that soup can be enjoyed all year long. So pin this soup and save it for a cold day or make it tonight for a fast, one-pot meal that won’t disappoint. 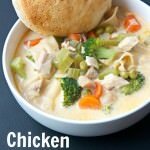 This soup combines two of my favorite comfort foods: chicken noodle soup and chicken pot pie. What a perfect soup! In a large saucepan heat olive oil over medium high heat. Add carrots, celery, onion and minced garlic; sauté about 5 minutes or until vegetables are tender, stirring occasionally. Stir in chicken broth, chicken, noodles, seasoned salt, dry mustard, chili powder and pepper. Bring to boil, reduce heat and cover. Simmer for 6 minutes or until noodles are tender. In a small bowl whisk together half and half and flour and add to the saucepan. Stir in broccoli and peas. Simmer for 5 minutes more until slightly thickened. Serve with biscuits.